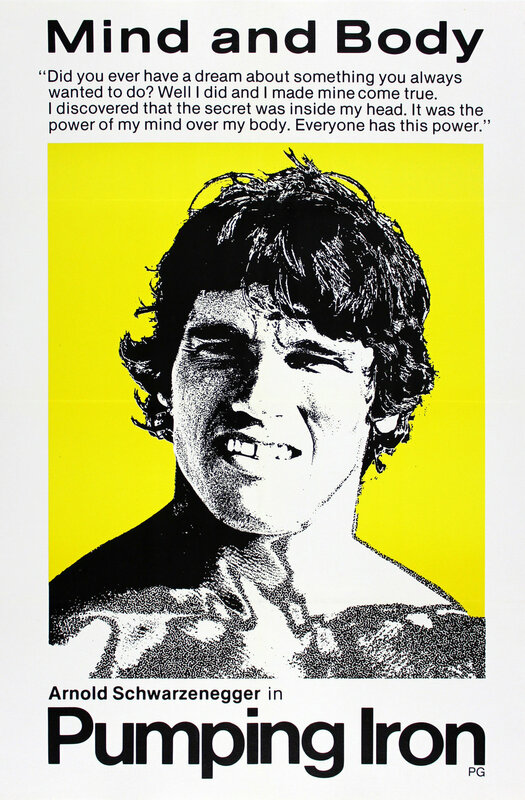 If you didn’t know any better, reading the quote on that poster could almost give you the impression that Pumping Iron is some sort of The Secret-esque load of garbage that Arnold Schwarzenegger had been pushing at one point. For those of you who haven’t seen the movie, let us assure you that that is not the case. As far as we know— we’re going to assume that that’s the case until the point where we begin cornering people in order to have lengthy, uncomfortable conversations about how the power of your mind is the most powerful power there is, and you just have to really want something to achieve it. Is that even what The Secret is about? Are crystals involved in some fashion? Please do not take this as an invitation to email us about it. Pumping Iron is actually about the bodybuilding world of the mid-Seventies (1970’s), and focuses on the paths that lead Arnold Schwarzenegger and Lou Ferrigno to the 1975 Mr. Olympia competition. For a movie that contains a lot of shots of unsettlingly muscle-y guys working out and grunting and generally looking like they’re in incredible pain, there are a lot of moments in the movie that are pretty charming. Schwarzenegger himself is responsible for a lot of that charm, which is a little surprising, considering that he talks about and does things over the course of the movie that don’t paint him in the best light— talking about wanting to be powerful, like Jesus or a dictator, for example. That’s the sort of thing that might typically (and rightfully) unnerve you to hear, but it somehow doesn’t seem as problematic when it’s coming out of his mouth. But, again, we can’t discount the possibility that this movie brainwashed us.